The magical Golden Tome contains powerful knowledge collected over the centuries by the druids. Fearing greed and its misuse by oppressors, six sages hid the Tome in a cave under a sacred circle. The time has come to unlock some of its powers however, but the Tome still needs protection, and you have been chosen to fulfill this task. Explore this mystic world alongside a druid magician, searching for the crystals to unlock the cave. Challenge 90 addicting levels of Match 3 gameplay, collecting magic and other powerful aids to help in your quest. Locate items in special Hidden Object scenes, enjoy beautifully-created Celtic music, and protect the Golden Tome from falling into the wrong hands. Download free full version of The Legend of the Golden Tome today! 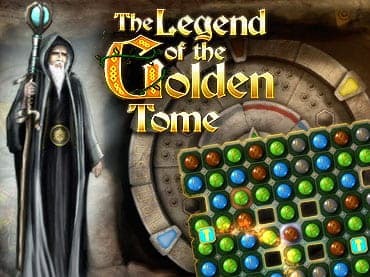 Free Game features: - Explore a mystical world in search of powerful gems with this Match 3 quest; - Challenge 90 levels alongside a druid magician; - Collect magic and other powerful aides to help in your quest; - Locate items in special Hidden Object scenes; - Enjoy a wonderful atmosphere with great visuals and enchanting Celtic music. If you have questions about The Legend of the Golden Tome game, please contact us using this form.